A chance meeting at a university campus gave birth to one of Saskatchewan’s most innovative young companies. 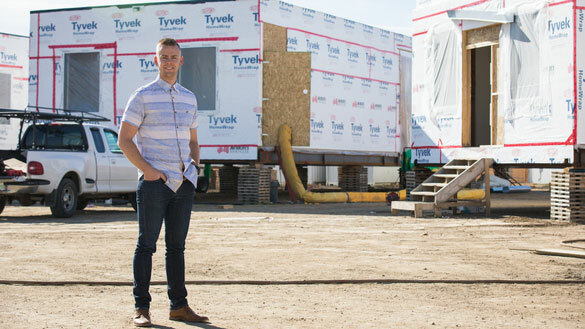 Bryan McCrea, a business student at the University of Saskatchewan, and Evan Willoughby, an engineering student, decided it would be a good idea to repurpose shipping containers as worksite structures for the construction, mining and oil and gas industries. They devised a way to turn those tough, easily transportable steel shipping boxes into comfortable, highly customizable, low-cost living and workspaces. They parlayed a turn in the spotlight on Dragon’s Den in 2011 into a partnership with Saskatchewan-born entrepreneur W. Brett Wilson, and away they went. Their first big project was to build a mining camp in northern Saskatchewan. This project proved the concept and resulted in a larger second order from their client. A major contract to provide living quarters for the Department of National Defence followed, and the business has been expanding ever since. The partners’ early focus on the mining and oil and gas sectors left them at the mercy of very cyclical businesses as far as capital investment went. The total focus on the resources sector was like having blinders on, McCrea adds. Diversifying has meant that over the past three years 3twenty Modular has seen 45 per cent year-over-year growth. The company, which has become the province’s largest manufacturer of portable classrooms for schools, is also constructing permanent 12,000- to 15,000-square-foot commercial office buildings. 3twenty also works with First Nations groups on community centres, health clinics, band offices and housing. “We’re really looking at any type of building and trying to see if we can modularize it, so there’s a ton of opportunity because of our abilities to work in multiple industries and markets." McCrea says one of the unique things about doing business in Saskatchewan is the sense of community, having the ability to grab the phone and talk shop with other business owners.